Back in December, I planned a trip to Dubuque, Iowa and parts of Wisconsin. O’Hare is the closest major airport so I couldn’t resist taking a detour along the beginning of Route 66, which starts in downtown Chicago. I wasn’t able to snap a photo of the “begin Route 66” sign because there is no good place to park, I was by myself and city driving stresses me out—but I did see it with my own eyeballs, which sometimes just has to be enough. I try not to start any new adventure without first fueling up on diner breakfast—the more historic the diner, the better. 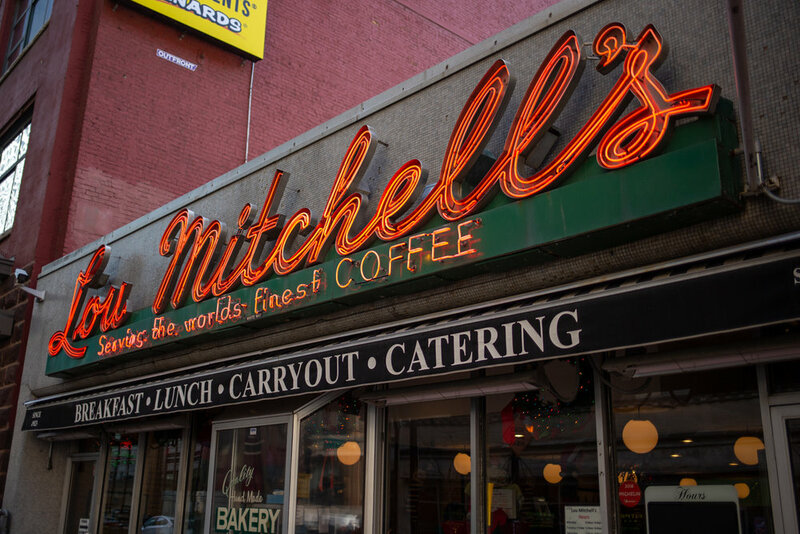 You can’t get much better than Lou Mitchell’s, which has been serving travelers since 1923, predating the creation of the Mother Road by three years. 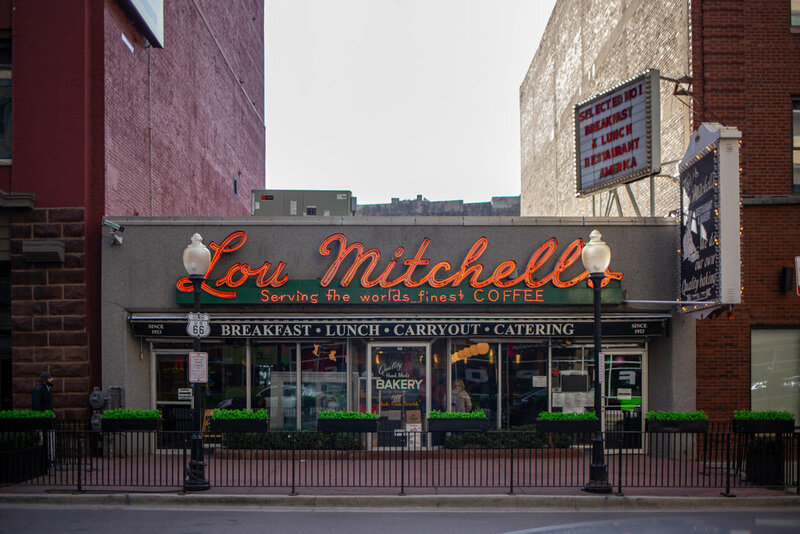 I’ve never been steered wrong by choosing a diner based on age, history and signage and Lou Mitchell’s gets an A+ in all three categories. 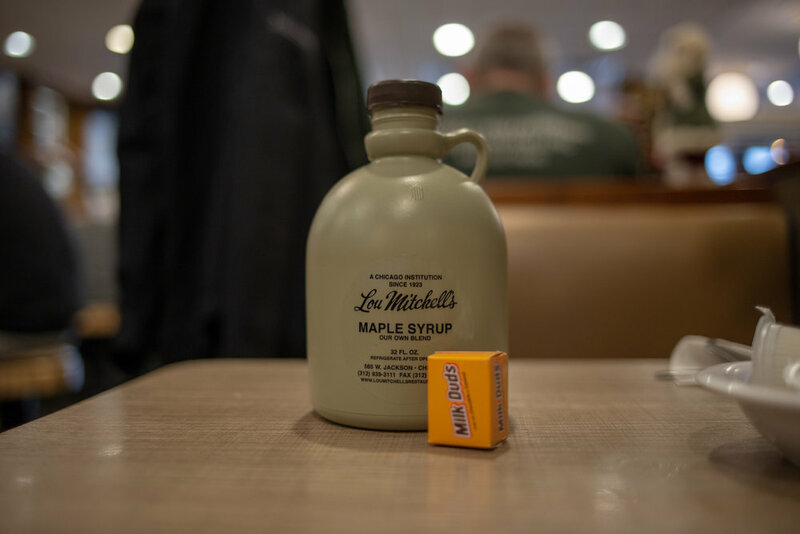 As soon as you walk into Lou Mitchell’s, you’re greeted with a donut hole and a miniature box of candy (I got Milk Duds), which is as good a welcome as I’ve ever received at a diner. 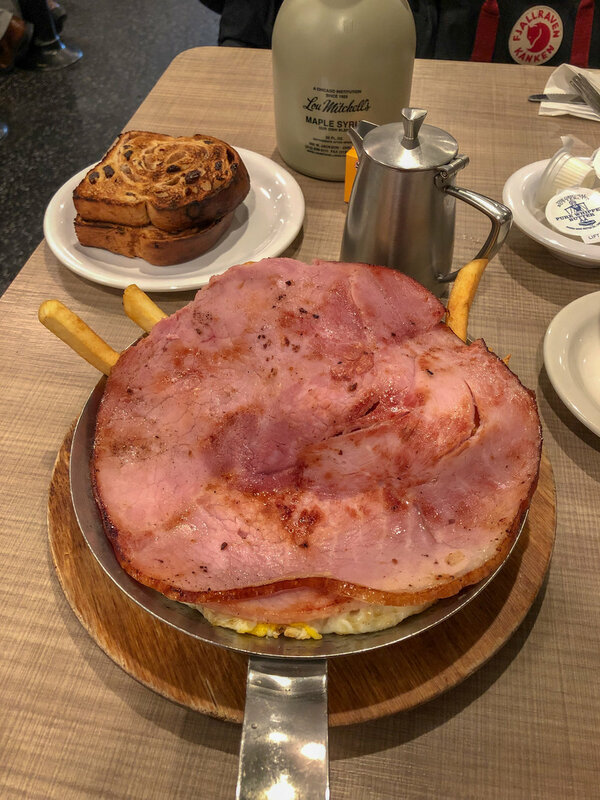 My breakfast skillet came topped with a slice of ham that was literally larger than my face and even if the slogan “serving the world’s finest coffee” is a bit of a stretch, my cup was certainly adequate (and refilled frequently which is the mark of a truly fine diner). I was a bit disappointed with the lack of signs and general Route 66-ness at the beginning of the drive, but my next stop was Henry’s Drive-in, located in Cicero, IL. I’ve been known to drive far out of my way or do some fancy maneuvering just to photograph a good sign, and Henry’s is a great sign—and luckily right on Route 66. 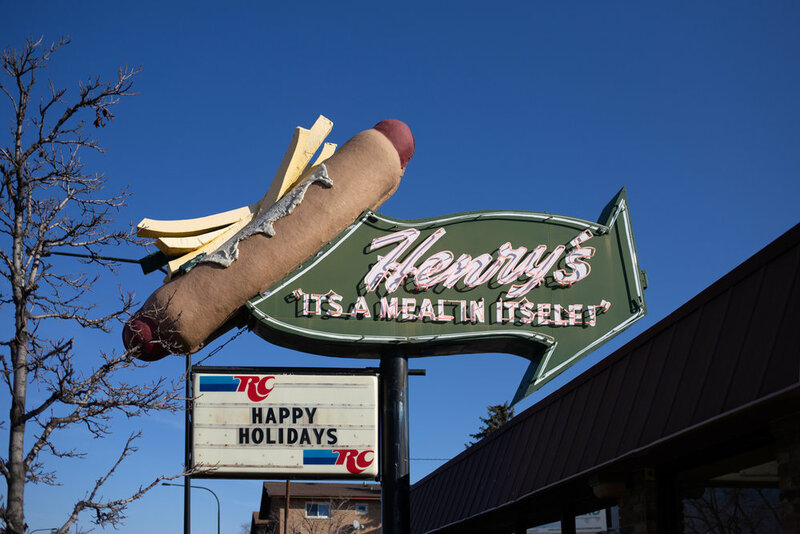 The hot dog shop has been in the same location since the ‘60s and while I can’t vouch for their dogs, I am suspicious of any sandwich that comes with the fries on top (a tradition from the beginning at Henry’s, as indicated by their sign). 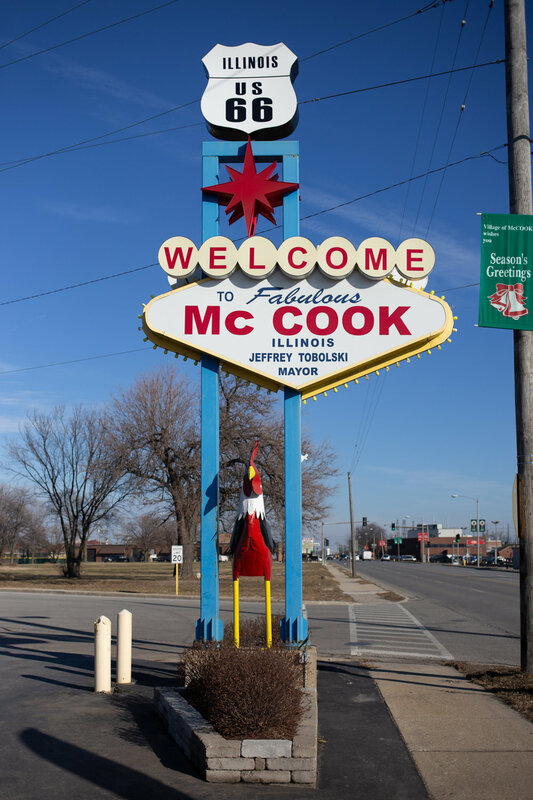 My next stop was McCook, IL, which wasn’t a planned stop but I couldn’t resist pulling over to take a photo of their Vegas-themed welcome sign. It looks new, but they tried and I appreciate the effort. I made a detour off Route 66 to see the Frankenstein Muffler Man at Haunted Trails, which was definitely worth it—if there’s one piece of travel advice that I live by, it would be: always take the detour (or in this case, a detour from the original detour). 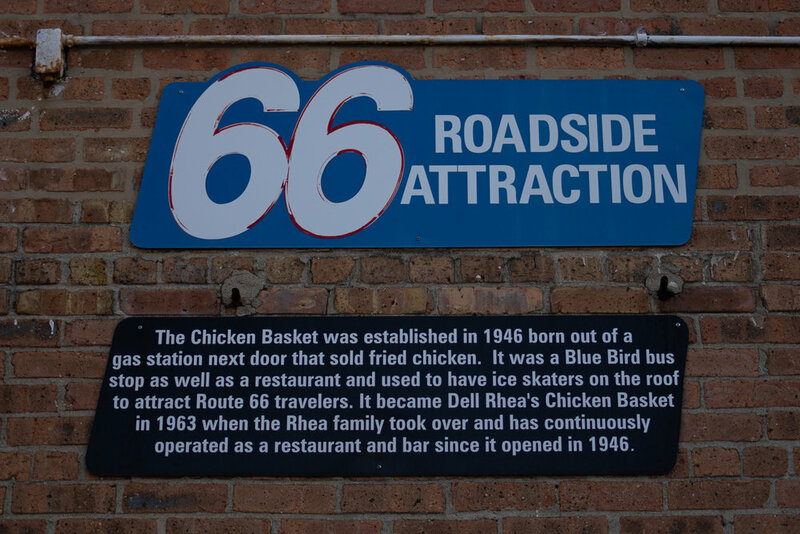 Back on Route 66, I stopped at Dell Rhea Chicken Basket, which has been continuously operating as a bar and a restaurant since 1946. It’s a shame I couldn’t eat at every one of these historic eateries but I was still so full of ham (three months later I still feel like I’m full from that ham slice) that I just took a quick photo and got back on the road. 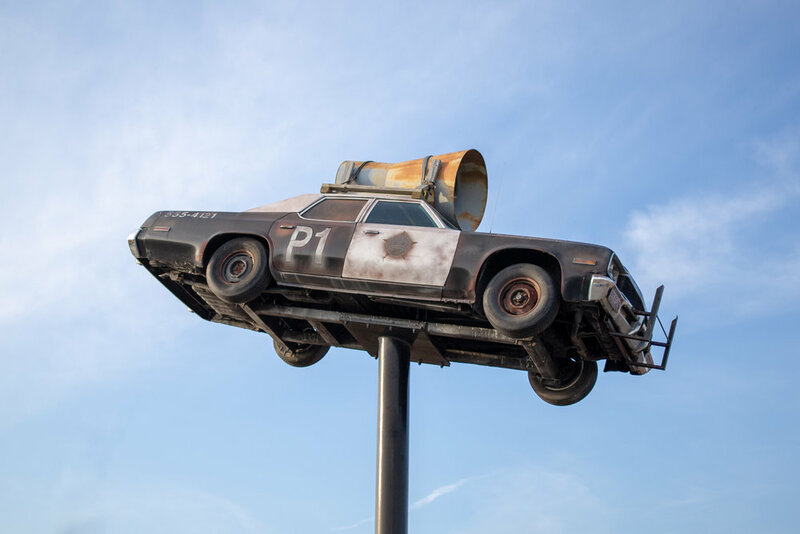 Route 66 takes you right through Joliet, known as the home of the Blues Brothers—even the gas station had a replica Bluesmobile perched atop a pole in the parking lot. The 1974 Dodge Monaco was built by the owners of the Route 66 Food N Fun Travel Center as a photo op and the car is just a shell—it has no fuel tank, engine or drive train. Joliet is about 20 min north of Wilmington, IL, home of the Gemini Giant and my end point on Route 66 for the day. 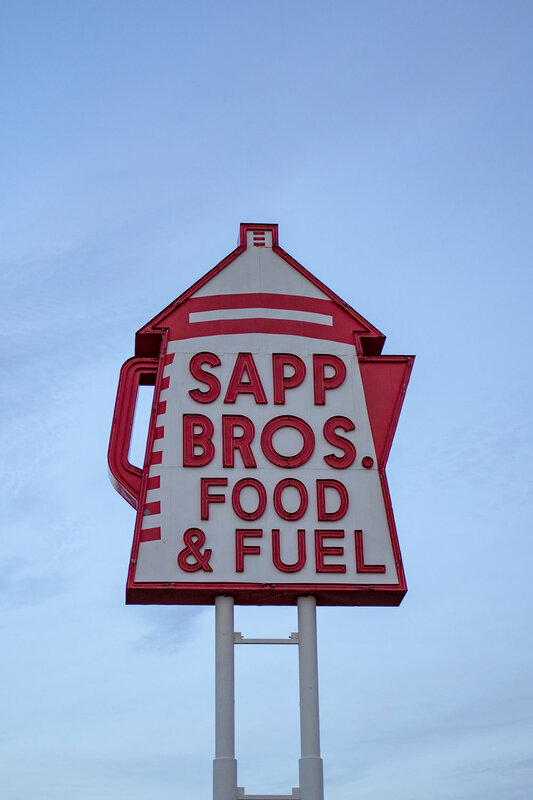 I headed northwest from Wilmington—stopping only to take a photo of the Sapp Bros. coffee pot sign—toward Dubuque, a three-and-a-half hour drive. I had driven all day and ended up further from my destination than when I started but I’ve never regretted taking the long way yet.